PRESIDENT NICOS ANASTASIADES has said that a controversial bank levy on private depositors in Cyprus’ banks as part of an EU bailout deal was the “least painful” option for the financially embattled island. “I chose the least painful option, and I bear the political cost for this, in order to limit as much as possible the consequences for the economy and for our fellow Cypriots,” Anastasiades said in a televised address to the nation. As a condition for a desperately-needed €10 billion bailout for Cyprus, fellow eurozone countries and international creditors imposed a levy on all deposits in the island’s banks in Saturday. Deposits of more than €100,000 will be hit with a 9.9 per cent charge, while under that threshold the levy drops to 6.75 per cent. Anastasiades urged all political parties in Cyprus to ratify the terms of the EU deal when parliament meets tomorrow. 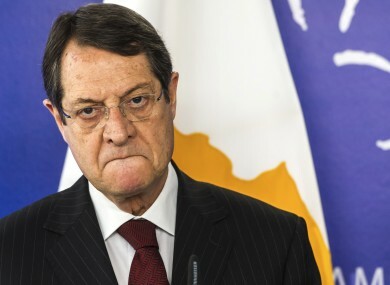 “I urge the parliamentary parties to decide, and I will fully respect their decision, in the best interests of the people and this country,” Anastasiades said. “The solution we came to is certainly not the one we wanted, but it’s the least painful under the circumstances,” the president said. Anastasiades needs to get the legislation ratifying the deal through parliament before banks reopen Tuesday after a long three-day weekend or face a run on accounts. But Cyprus media reported that the scale of revolt against the agreement among MPs has thrown into disarray his efforts to do so over the weekend, and he may have to declare an additional bank holiday on Tuesday. Cyprus also postponed until Monday an emergency debate in parliament on the deal that was scheduled for Sunday. Email “Cypriot president: Bank deposits levy the 'least painful option' ”. Feedback on “Cypriot president: Bank deposits levy the 'least painful option' ”.